2015 was a record year for sales, orders and the number of active customers. This allowed us to re-invest €2.5 million during 2015 in new equipment and new products to keep our customers at the cutting edge of PCB technology. NAKED proto. “true” prototype service for prototypes without soldermask. SEMI-FLEX pool. 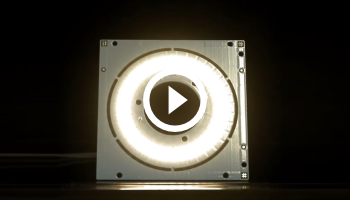 To answer the demand for FLEX-TO-INSTALL prototypes and small series. BINDI pool extended. More options added for BINDI pool. New Auto-repair function in PCB Visualizer. Intelligent DRC rules repair Annular Rings that are too small to manufacture. Outline/Milling Editor. Use the Outline/Milling Editor to correct the board outline where the outline (profile) data is missing, incomplete, incorrect or duplicated (two outlines found). We updated our Pre Production Approval functionality to handle DATA issues. This new way of handling data issues reduced the number of real exceptions that stopped the processing of data, no matter how briefly, by a factor 6 to 4% of all data sets. New eurocircuits.com website. We renewed our website to better serve the need of the electronics design engineers offering clearer information and tools. eC-placer. 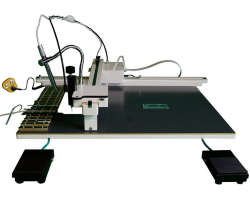 To manually assist and aid with accurate and fast population of components to your PCB prototype. eC-fume-cube. An efficient and silent fume extraction system to complement our eC-reflow-mate-hood. For more information, see our BLOG Looking back at 2015. 2016 we will focus on our core business processes, making them faster and more efficient. In looking back at 2015 we gave an overview of last years’ achievements. This year we will prepare ourselves to handle more than 100.000,- orders in our manufacturing and over 400.000,- data sets through our PCB Visualizer. Improving speed, performance and efficiency will be our top priority during the first 6 months of 2016. After the above goals will be achieved we still have many projects in the pipeline. 2015 we made our PCB Visualizer vector based allowing more PRE-CAM tasks to be performed and allowing a better interaction with the user. Our goal is still to automatically process PCB data as far as possible through the CAM operations before our customer launches his order. At the same time interactively solving potential production issues before they delay delivery or increase costs. All this means that the data will be composed, like Gerber, of “real” entities (tracks, pads, planes, holes etc.). This allows for faster processing, but also opens the way for a whole range of new applications and repair solutions like auto repair of annular rings and outline editor explained in looking back at 2015. What will come next, when and what still needs to be revealed will become clear during 2016. 2016 is one of the most exciting years for Eurocircuits yet, with the new improvements we plan, investments made and our new building. To top it all we will celebrate our 25th anniversary, on the 1st of May! For more information, see our BLOG: Looking forward at 2016. All our boards are produced in our own factories in Germany, Hungary and India. 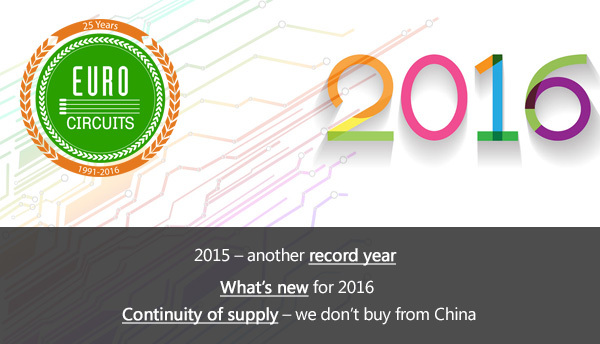 Don’t let your PCB supply get threatened by the Chinese New Year shut-downs in the coming weeks. Contact us (euro@eurocircuits.com) and we will be happy to keep your production flowing. Our BINDI pool service now handles orders up to 50 m2. 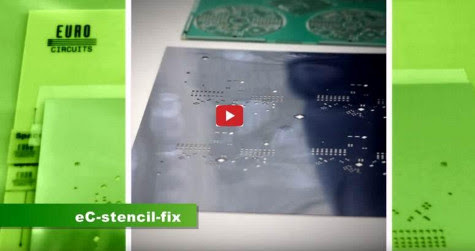 Eurocircuits are renowned for their quality Prototype PCB’s and Equipment but did you know we also provide solder paste stencils for precise application of solder paste to your design. So the question is how do you achieve that professional production quality on a prototype design? Eurocircuits have the answer, we developed a unique free service of eC-registration (http://www.eurocircuits.com/ec-registration-system) where we place registration holes in a frame around your boards and registration holes in the stencil for precise, repeatable stencil alignment. The Southern Manufacturing and Electronics show is free to visit and runs 9th – 11th February 2016 In Farnborough. 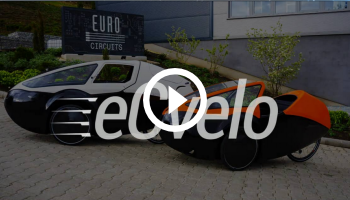 See first-hand how Eurocircuits can help you produce professional assembly of your prototype designs. No nosso blog olhando para 2015, apresentámos um panorama das realizações dos últimos anos. Este ano, estamos a perparar-nos para lidar com mais de 100.000 pedidos na nossa produção e mais de 400.000 análises de conjuntos de dados através do nosso PCB Visualizer. => Melhorar a velocidade, desempenho e eficiência será a nossa prioridade número um durante os primeiros 6 meses de 2016. Em 2015 fizemos o nosso PCB Visualizer ser baseado em vectores permitindo assim que mais tarefas de pré-CAM possam ser realizadas e permitindo uma melhor interação com o usuário. O nosso objetivo é continuar a processar automaticamente os dados PCB, tanto quanto possível através das operações CAM diante dos nossos clientes no lançamento dos seus pedidos permitindo, simultaneamente, uma interação com o cliente que permita resolver problemas de produção potenciais antes que estes tragam atrasos e aumentem os custos. Outros ajustes conforme descrito nos nossos BLOGS: Eurocircuits Data Preparation – Single Image 1 and Eurocircuits Data Preparation – Single Image 2. PCB Solver irá exibir automaticamente os resultados destes procedimentos imediatamente através do PCB Visualizer. Pode ver exatamente a imagem da sua placa final antes de colocar a sua encomenda. Se encontrar quaisquer problemas potenciais, tem tempo para modificar o seu design ou falar com os nossos engenheiros via Chat Online. Design para a assemblagem. Duas ferramentas de previsão para ajudar a detectar locais onde há um risco de má solda. Fuga de solda. Detectar e colocoar banderiras vermelhas em lugares onde poderia escapar da solda do pad, deixando uma junta fraca. Ponte de solda. Detectar e colocar bandeiras em potenciais shorts de solda com base em distâncias de isolamento mínimas, configuração de soldermask e tipo de processo de solda. Soldermask de alta definição. Em 2015, instalamos uma nova máquina de imagem direta Ledia. Esta expõe o soldermask directamente, sem a necessidade de PhotoTools. A exposição directa permite folgas estreitas entre máscara de solda e os pads, bem como teias finas entre janelas de Soldermask para mais fácil e confiável montagem de componentes difíceis (QFN, BGA, pequeno passo, etc …). Veja o nosso PCB Design Guidelines p. 15. In 2016 our focus will be on our core business processes, making them faster and more efficient. In our BLOG looking back at 2015 we presented an overview of last years’ achievements. This year we are preparing ourselves to handle more than 100.000,- orders in our manufacturing and over 400.000,- data sets through our PCB Visualizer. => Improving speed, performance and efficiency will be our number one priority during the first 6 months of 2016. 2015 we made our PCB Visualizer vector based allowing more PRE-CAM tasks to be performed and allowing a better interaction with the user. Our goal is still to automatically process PCB data as far as possible through the CAM operations before our customers launch their orders. Simultaneously allowing customer interaction to solve potential production issues before they delay delivery or increase costs. What this means is that the data will be composed, like Gerber, of “real” entities (tracks, pads, planes, holes etc.). This allows for faster processing, but also opens the way for a whole range of new applications and repair solutions, for example, like auto repair of annular rings and outline editor as explained in our BLOG looking back at 2015. Other adjustments as described in our BLOGS: Eurocircuits Data Preparation – Single Image 1 and Eurocircuits Data Preparation – Single Image 2.PCB Solver will automatically display the results of these procedures immediatly via the PCB Visualizer. 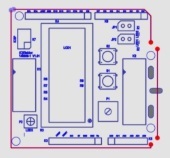 You can exactly see what your finished board will look like before you place your order. If you find any potential issues, you have time to modify your design- or talk to our engineers via Online Chat. Solder paste editor. Edit solder paste pads on customer’s own paste layer or one generated by Eurocircuits. Functions include adding and deleting pads, as well as enlarging or shrinking them in X, Y or both. Add tooling holes or targets plus dimensions and positioning for the stencil. Design for Assembly. Two predictive tools to help to detect locations where there is a risk of poor soldering. Solder escape. Detect and flag places where solder could escape from the solder-pad, leaving a weak joint. Solder bridge. Detect and flag potential solder shorts based on minimum isolation distances, soldermask configuration and solder process type. High definition solder mask. 2015, we have installed a Ledia direct imaging machine. This exposes standard photo-imageable soldermasks directly, without the need for phototools. Direct exposure allows narrower clearances between soldermask and copper pads as well as thinner webs between soldermask windows for easier and more reliable assembly of difficult components (QFN, BGA, small pitch, etc…). See our PCB Design Guidelines p. 15. 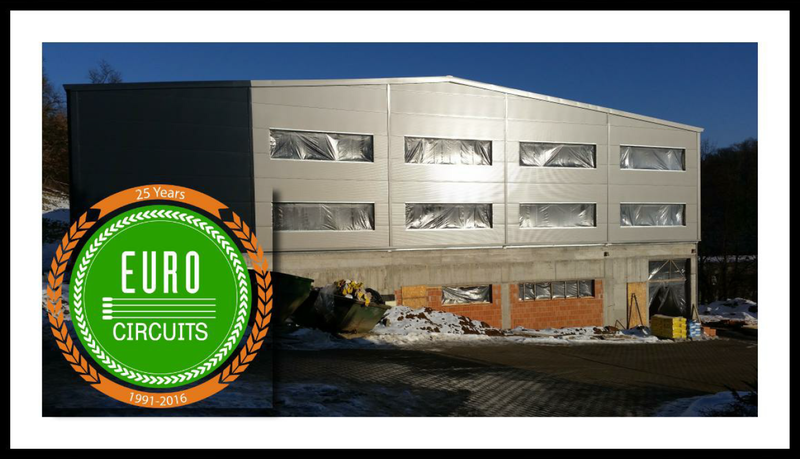 And we are looking forward to the finishing of our new building in Eger and our 25th anniversary on the 1st of May 2016! En nuestro blog mirando a 2015, presentamos una visión general de los logros de los últimos años. Este año, estamos preparandonos para manejar más de 100.000 pedidos en nuestra producción y más de 400.000 análisis de conjuntos de datos a través de nuestro PCB visualizador. => Mejorar la velocidad, el rendimiento y la eficiencia será nuestra prioridad número uno durante los primeros 6 meses de 2016. En 2015 hicimos nuestro visualizador de PCB basado en vectores permitiendo así que más tareas de pre-CAM puedan ser realizadas y permitiendo una mejor interacción con el usuario. Nuestro objetivo es continuar procesando automáticamente los datos de PCB tanto como sea posible a través de las operaciones de CAM en el lanzamiento de sus pedidos, lo que permite simultáneamente la interacción con el cliente con el fin de resolver los posibles problemas de producción antes de haber retrasos y aumentos de los costes. Otros ajustes como se describe en nuestros blogs: Eurocircuits Data Preparation – Single Image 1 and Eurocircuits Data Preparation – Single Image 2. PCB Solver mostrará automáticamente los resultados de estos procedimientos de forma inmediata a través del visualizador de PCB. Usted puede ver exactamente la imagen de su placa final antes de realizar su pedido. Si encuentra cualquier problema potencial, tiene tiempo para modificar el diseño o hablar con nuestros ingenieros a través del Chat Online. Editar los pads en los archivos generados por el cliente generados por Eurocircuits. Las funciones incluyen la adición y la eliminación de los pads, así como aumentar o disminuir en X, Y o ambos. Añadir agujeros de herramientas o dimensiones y objetivos de posicionamiento para el stencil. Diseño para el montaje. Dos herramientas de predicción para ayudar a detectar donde hay un riesgo de mala soldadura.Escape de soldadura. Detectar y poner banderas rojas en lugares donde se puede escapar la soldadura del pad, dejando una unión débil. Soldermask de alta definição. Em 2015, instalamos uma máquina de imagem direta Ledia. Esta expõe o soldermask directamente, sem a necessidade de PhotoTools. A exposição directa permite folgas estreitas entre máscara de solda e os pads, bem como teias finas entre janelas de Soldermask para mais fácil e confiável montagem de componentes difíceis (QFN, BGA, pequeno passo, etc …). Veja o nosso PCB Design Guidelines p. 15. Estamos ansiosos para o finalizador do nosso novo edifício em Eger e festejar o nosso 25º aniversário no dia 01 de maio de 2016! Toutes les ventes sont en € hors frais de transport et taxes. Eurocircuits a eu une croissance constante du nombre de clients et des commandes dans les deux dernières décennies. 2015 a été une année de succès avec un chiffre d”affaires consolidé, y compris dans les services de PCB, l”équipement et des fournitures avec un chiffre d’affaires de 20 millions d”euros. Cette croissance nous permet de continuer à développer de nouveaux produits et services pour nos clients. Nous allons continuer à investir dans de nouveaux équipements et de nouveaux procédés pour vous garder à la fine pointe de la technologie PCB, et en fournissant plus d”outils pour vous aider à livrer vos produits sur le marché à l”heure et dans le budget. En 2016 il y aura un bond en avant pour nos services de PCB, des logiciels. Ceux-ci sont décrits dans notre Blog «Pour l”avenir en 2016″. Nous résumons ici les nouvautés en 2015..
NAKED proto. Nous avons lancé ce service de prototype «réel» pour réduire les coûts et de répondre aux demandes de prototypes sans vernis d’épargne. SEMI-FLEX pool. Pour répondre aux demandes de prototypes FLEX. De nouvelles options de finition d”or. 1.Nous avons augmenté les capacités de PCB Visualizer. Nous nous sommes concentrés dans le temps et la vitesse de réponse du système, mais aussi la reconstruction de base pour traiter les données vectorielles. Nous avons traité 335.000 archives de PCB dur un temps moyen de 139 secondes par réponse du système apportant ainsi une analyse complète et affichant l’image du pcb sur l”écran dans les trois minutes en moyenne (il a des moments de pointe le matin et autour de 16h00 et le temps traitement d”un pcb avec deux coches n’est pas le même que pour une plaque de 12 couches, l’analyse des données peut varier en fonction de ces variables). 3.Outline/Milling Editor. Utilisez l ‘éditeur de Contour/ fraisage pour fixer les limites de la plaque où les données (profil) sont manquantes, incomplètes, erronées ou en double (deux contours trouvés). 4.Nouveau site web.. Nous avons renouvelé notre site web afin de mieux répondre aux besoins des ingénieurs en fournissant des informations plus claires et de nouveaux outils. eC-fume-cube. Un système d”extraction de fumée efficace et silencieuse pour compléter notre eC-reflow-mate-hood. Nous avons organisé une série d”ateliers sur le soudage de prototypes et travailler avec le système EAGLE CAD. Beaucoup de nos clients ont mis à jour leurs systèmes de Eagle en été quand CadSoft a publié une nouvelle version. Si vous souhaitez participer à un atelier, s”il vous plaît contactez votre équipe de vente locale ou par e-mail euro@eurocircuits.com. Licences de logiciel supplémentaires afin de maximiser la capacité et la vitesse de notre site Web afin de fournir un meilleur accès et expérience à nos utilisateurs. Développement du PCB Visualizer. Chaque année, nous dépensons environ 300 mille euros dans le développement de nos outils en ligne parce que nous croyons dans des solutions qui rendent nos commandes plus eficientes et rapides. Nous avons acquis deux nouvelles imprimantes à jet d”encre Orbotech Sprint 120 et avons mis à jour notre ancienne avec les nouvelles technologies. Nouveaux dispositifs d”enduction par pulvérisation de vernis d’épargne dans notre usine de Eger. De nouvelles machines de forage, de routage et de V-CUT. 7 nouvelles machines Schmoll ont été incluses dans notre parc de machines qui porte en particulier le routage et même les dernières normes élevées de l”article V.
Une machine à la corrosion pour le plasma supplémentaire, AOI, équipement de laboratoire, etc … complètent la liste des 2015 machines installées. Todas as vendas estão em €, excluindo os custos de transporte e impostos. Eurocircuits tem mostrado um crescimento consistente em clientes e encomendas nas últimas 2 décadas. 2015 foi um ano de sucesso com um volume de negócios consolidado, incluindo serviços de PCB, EC-equipamento e consumíveis superior a 20 milhões de euros. Este crescimento permite-nos continuar a desenvolver novos produtos e serviços para os nossos clientes. Vamos continuar a investir em novos equipamentos e novos processos para mantê-lo na vanguarda da tecnologia PCB, e para obter mais das ferramentas que o ajudarão a entregar os seus produtos no mercado a tempo e dentro do orçamento. Em 2016 irá haver um salto em frente nos nossos serviços de PCB, em ferramentas de software PCB e em EC-equipamento. Estes estão descritos no nosso Blog “Olhando para a frente em 2016” . Aqui vamos resumir as novidades em 2015. Aumentamos as capacidades do PCB Visualizer. Estivemos focados velocidade e tempos de resposta do sistema, assim como a reconstrução do núcleo para lidar com dados de vetor. Em 2015 processamos 335.000 dados de PCBs com um tempo médio de resposta do sistema de 139 segundos trazendo assim uma análise completa e visualização da placa no ecran dentro de 3 minutos em média (existe momentos de auge na parte da manhã e em torno das 16H00 e o tempo de processamento de uma placa de 2 camadas não é o mesmo que para uma placa de 12 camadas, experiências reais podem variar em relação à média baseada nessas circunstâncias.). No Outono de 2015, conseguimos transformar o sistema num sistema baseado em vetores reais que constitui o fundamento para muitas novas aplicações. Os pontos 2 e 3 são exemplos disso. Nova função Auto-Repair em PCB Visualizer. Regras inteligentes DRC rules reparam anéis anulares que são demasiados pequenos para fabric. Outline/Milling Editor. Use o Editor de Contorno / Fresagem para corrigir o contorno da placa onde os dados (perfil) esboço está ausente, incompletas, incorretas ou em duplicado (dois contornos encontrado). Atualizamos a nossa funcionalidade de Aprovação Pré-produção para lidar com problemas de dados. Esta nova maneira de lidar com problemas de dados reduziu o número de excepções reais que paravam o tratamento de dados, não importa quão breve, por um fator de 6-4% de todos os conjuntos de dados. Novo website. Renovamos o nosso site para servir melhor as necessidades dos engenheiros de design de eletrônicos oferecendo informações mais claras e ferramentas. eC-placer. Para auxiliar manualmente e ajudar na montagem precisa e rápida de componentes no seu protótipo PCB. eC-fume-cube. Um sistema de extracção de fumos eficiente e silencioso para complementar o nosso eC-reflow-mate-hood. Organizamos uma série de workshops sobre soldagem de protótipos e sobre como trabalhar com o sistema EAGLE CAD. Muitos dos nossos clientes atualizaram seus sistemas de Eagle no verão, quando CadSoft lançou uma nova versão. Se gostaria de participar num workshop, entre em contato com sua equipe de vendas local ou por e-mail: euro@eurocircuits.com. Com base nesta experiência, introduzimos uma série de blogs sobre layout e EAGLE which you can find here. Licenças de software extra para maximizer a capacidade evelocidade do nosso website, para poder fornecer uma melhor acesso e experiencia aos nossos utilizadores. Desenvolvimento do PCB Visualizer. Cada ano gastamas cerca de 300 mil Euros em desenvolvimento das nossas ferramentas online porque acreditamos em soluçoes que façam as encomendas serem mais efeientes e rapidas. Adquirimos 2 novas impressoras jato de tinta Orbotech Sprint 120 e atualizamos a nossa antiga com novas tecnologias.Novas coaters de spray de solder mask spray na nossa fábrica em Eger. Novos máquinas de perfuração, de roteamento e V-CUT. 7 novas máquinas Schmoll foram incluídas no nosso parque de máquinas trazendo especialmente roteamento e até os mais recentes padrões elevados de corte V.
Uma máquina de corrosão por plasma extra, AOI, equipamentos de laboratório etc … completam a lista de 2015 máquinas instaladas. Todas las ventas están en euros sin incluir los gastos de transporte e impuestos. Eurocircuits ha mostrado un crecimiento constante en el número de clientes y pedidos en las últimas dos décadas. 2015 ha sido un año de éxito con una facturación consolidada, incluidos los servicios de PCB, EC-equipo y materiales con una facturación superior a 20 millones de euros. Este crecimiento nos permite continuar desarrollando nuevos productos y servicios para nuestros clientes. Vamos a seguir invirtiendo en nuevos equipos y nuevos procesos para mantenerlo a la vanguardia de la tecnología de PCB, y ofrecer más herramientas para ayudarle a ofrecer sus productos al mercado a tiempo y dentro del presupuesto. 2016 será un paso adelante para nuestros servicios de PCB, herramientas de software y equipos EC-PCB. Estos se describen en nuestro Blog “Mirando hacia el futuro en el año 2016”. Aquí resumimos las noticias en 2015. SEMI-FLEX pool. Para responder a las solicitudes de prototipos FLEX-TO-INSTALL y pequeñas series. Nuevas opciones para acabado de oro. Aumentamos las capacidades del PCB Visualizer. Nos centramos en la velocidad y respuesta del sistema, como la reconstrucción del núcleo para hacer frente a los datos vectoriales. En 2015 procesamos 335.000 datos de PCBs con un tiempo medio de respuesta del sistema de 139 segundos con lo que un análisis completo y visualización de la placa en la pantalla está dentro de 3 minutos en promedio (existe momentos pico en la mañana y alrededor de 16:00 y el tiempo de procesamiento de una placa 2 capas no es el mismo que para una placa de 12 capas, experiencias, pueden variar de la media en base a estas circunstancias). En el otoño de 2015, conseguimos convertir el sistema en un sistema basado en vectores reales que es la base para muchas aplicaciones nuevas. Los puntos 2 y 3 son ejemplos de esto. Nova funcion Auto-Repair en PCB Visualizer. Regras inteligentes DRC normas fijan anillos anulares que son demasiado pequeños para la fabrica. Outline/Milling Editor. Utilice el Editor de contorno / fresado para fijar el límite de las placas donde los datos (perfil) croquis se encuentran, incompleta, incorrecta o duplicado (dos contornos encontrados). Actualizamos nuestra funcionalidad de aprobación previa a la producción para hacer frente a los problemas de datos. Esta nueva forma de hacer frente a los problemas de datos reduce el número de excepciones reales que se detuvo el tratamiento de datos, por breve que sea, en un factor de 6-4% de todos los conjuntos de datos. Nuevo website.. Renovamos nuestro website para servir mejor a las necesidades de los ingenieros de diseño electrónico proporcionando una información más clara y más herramientas. eC-placer. Para ayudar en el montaje de los componentes precisos en su prototipo de PCB. eC-fume-cube. Un sistema de extracción de humos eficiente y silencioso para complementar nuestro eC-reflow-mate-hood. Hemos organizado una serie de workshops de soldadura de prototipos y como trabajar con el sistema CAD EAGLE. Muchos de nuestros clientes actualizaron sus sistemas de Eagle en el verano cuando CadSoft lanzó una nueva versión. Si desea participar en un taller, por favor, póngase en contacto con su equipo de ventas local o por correo electrónico: euro@eurocircuits.com. Basándose en esta experiencia, hemos introducido una serie de blogs sobre layout y EAGLE which you can find here. Desarrollo del PCB Visualizer. Cada año gastamos alrededor de 300 mil euros en el desarrollo de nuestras herramientas en línea porque creemos en soluciones que hacen los pedidos más eficientes y rápidos. Nuevas coaters de spray de solder mask spray en nuestra planta en Eger. Nuevas máquinas de perforación, enrutamiento y V-CUT. Nuevas máquinas Schmoll se incluyeron en nuestro parque de máquinas con lo que todo el enrutamiento e incluso más altos estándares de la sección V-cut. Una máquina de la corrosión con plasma adicional, AOI, equipos de laboratorio, etc … completan la lista de máquinas instaladas en 2015. All sales figures are in € and exclude transport costs and taxes. 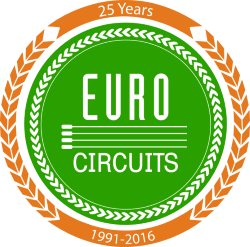 Eurocircuits has shown a consistent growth in customers and orders over the last 2 decades. 2015 has been another successful year with a consolidated turnover including PCB services, eC-equipment and consumables exceeding 20 million Euro. This growth allows us to continue to develop new products and services for our customers. 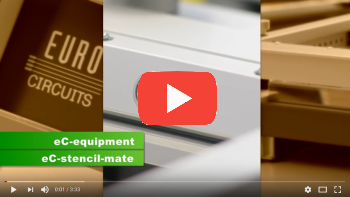 We will continue to invest in new equipment and new processes to keep you at the cutting edge of PCB technology, and to provide more of the tools that will help you deliver your products to market on time and on budget. 2016 will see another leap forward in PCB services, in PCB software tools and in eC-equipment. These are described in our “Looking forward in 2016” BLOG. Here let’s summarize what was new in 2015. NAKED proto. We introduced this “true” prototype service to lower costs and to respond to the demand for prototypes without soldermask. New options for Chemical Nickel-Gold Surface finish. Focus on PCB Visualizer core engine. We foucussed on speed and respons times of the system as well rebuilding the core to handle vector data. 2015 we processed 335.000,- PCB data sets with an average system repons time of 139 seconds thus bringing a full analyses and visualisation of your board on screen within 3 minutes average (We do see peek moments in the morning and around 16H00 and the processing time for a 2-layer board is not the same as for a 12-layer board, actual experiences may vary from the average based upon these circumstances.). By autumn 2015 we succeeded in turning the system into a real vector based system which builds the fundament for many new applications. Points 2 and 3 are examples of that. We updated our Pre-Production Approval functionality to handle DATA issues. This new way of handling data issues reduced the number of real exceptions that stopped the processing of data, no matter how briefly, by a factor 6 to 4% of all data sets. New website. We renewed our website to better serve the need of the electronics design engineers offering clearer information and tools. We organized a series of workshops on prototype soldering and on working with the EAGLE CAD system. Many of our customers upgraded their EAGLE systems in the summer when CadSoft released a major new version. If you would like to join a workshop, contact your local sales team or email euro@eurocircuits.com. Based on this experience we have introduced a series of BLOGs about layout and EAGLE which you can find here. Extra software licenses to boost the capacity and speed of our website, so that we can provide a better access experience to more customers at the same time. PCB Visualizer development. Each year we spend over 300k Euro in further development of our online tools because we believe in tools that make ordering faster and more efficient. 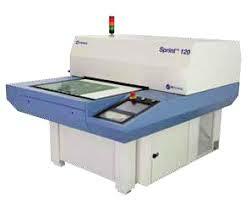 We acquired 2 new Orbotech sprint 120 inkjet printers and upgraded our old one”s to this latest technology. New solder mask spray coaters in our Eger plant. New drilling, routing and V-cut machines. New schmoll machines were added to our machine park bringing especially routing and V-cut up to the latest high standards.An extra plasma etching machine, AOI, laboratory equipment etc… complete the list of 2015 installed machines. It is the second week of our run up to the Southern Manufacturing and Electronics shows (http://www.industrysouth.co.uk/) and as promised another revealing taster of what you could expect to see at the exhibition from Eurocircuits. As most designers know, creating a product is only one part of the process and a fundemental part of getting a product to market is a cost effective functional testing method which could be implemented at the prototype stage and continued through production and eventally repair stage. 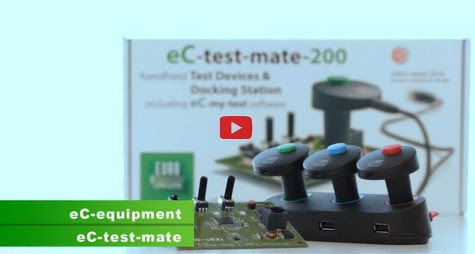 Eurocircuits have developed the answer – eC-test-mate, a functional test designed into the product and forever accessible at any stage. You can see the eC-test-mate and have live demos of how this remarkable functional test to revolutionise your testing philosophy on our booth M79. See first-hand how Eurocircuits can help you revolutionise your functional testing philosophy with our eC-test-mate.